There is a common flaw in the all-in-one iMac design. 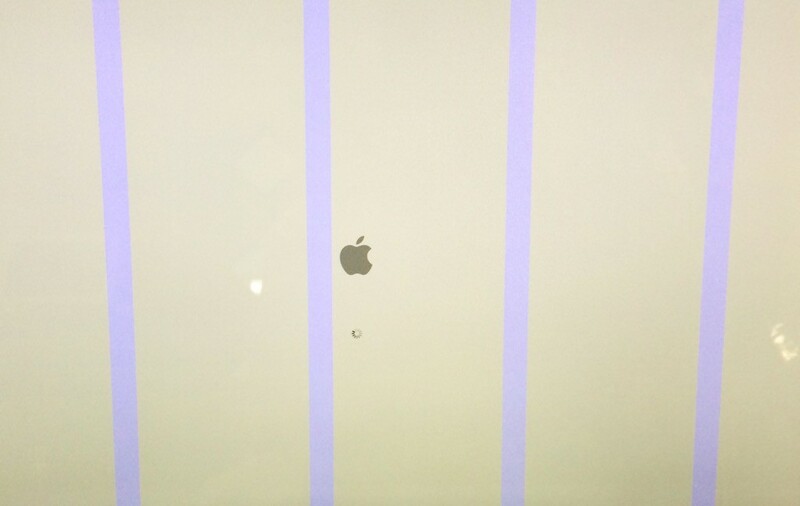 Due to internal space constraints, many iMacs develop an overheating graphics card issue that results in a black/blue/grey screen while the computer is powered on or a screen that shows vertical stripes or columns. Early symptoms are an iMac that fails to wake up from sleep or one that wakes up but only shows a black screen. 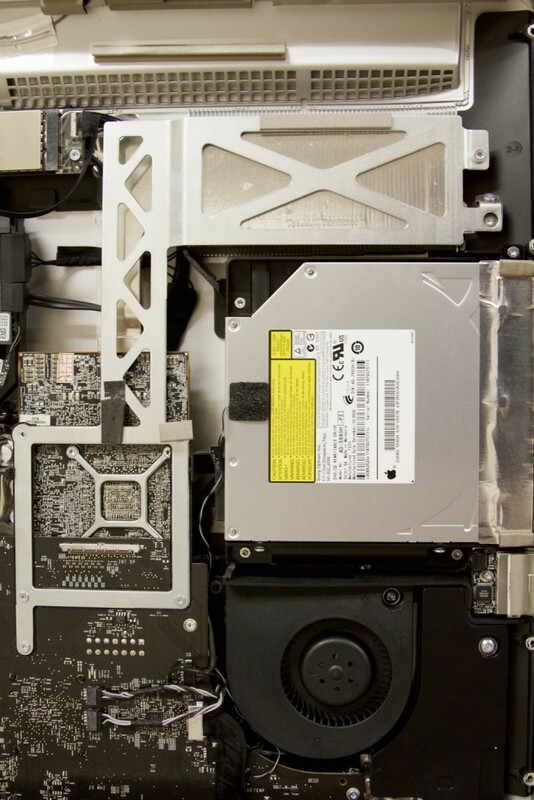 In the iMac heat is transferred from the graphics card chipset via copper pipes. The copper pipes then transfer heat to the silver cooling fins and out the backside of the iMac through a horizontal cut near the top. You’ll notice in the photo below that the fan sits down and to the right of the graphics card. The fan is situated far away from the cooling fins and is mostly obstructed by the optical drive. The fan’s job is to force the hot air out of the computer and away from the graphics card. 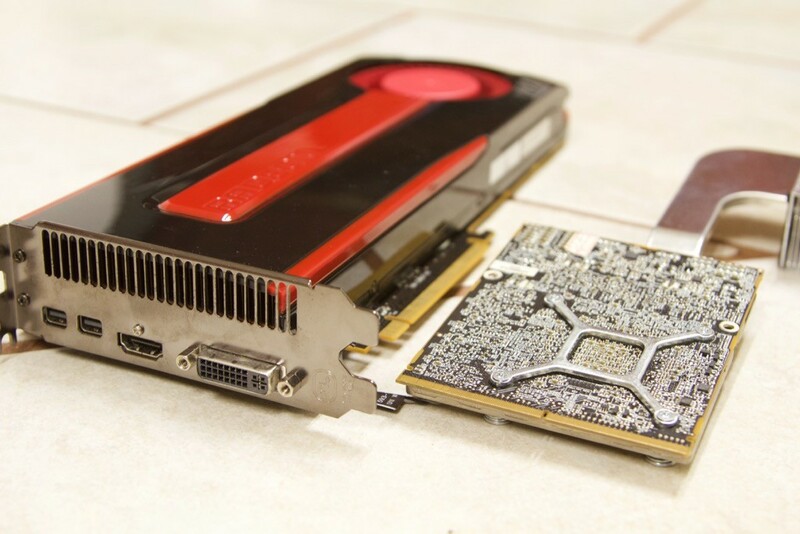 In the red desktop graphic card shown for comparison, you’ll notice the fan sits atop the GPU chipset and pushes the hot air directly out the opposite end of the card through large vents on top of the input ports. In the iMac the fan is not optimally placed to force out the hot air. Furthermore, all aging iMacs have a substantial amount of dust buildup on all components and most importantly the fan blades. This results in much less effective airflow. So where does all this heat originate? Each time the graphics card is taxed (when the computer is running Photoshop, playing Youtube videos, etc. ), hot air builds up. Over time the heating and subsequent cooldown of the graphics card leads minuscule cracks to develop in the soldered micro-connection between the GPU chipset and the logic board (or MXM board in this case). Eventually a connection is no longer made between the graphics card and the board contact points. This sends the computer into panic mode, and it refuses to boot. To make matters worse, an excess of thermal paste is often applied to the graphics card from the factory. Thermal paste helps with thermal conductivity, and there should only be a minimal amount used. In many Macs I’ve taken apart, the graphics cards and processors have been dabbed with a large glob of paste rather than a light spread. When there’s too much thermal paste, the graphics card chipset is essentially coated and surrounded with a thick substance that conducts heat well (or traps heat exceptionally well in this case). It would be like wearing a thick pair of socks when going for a run. 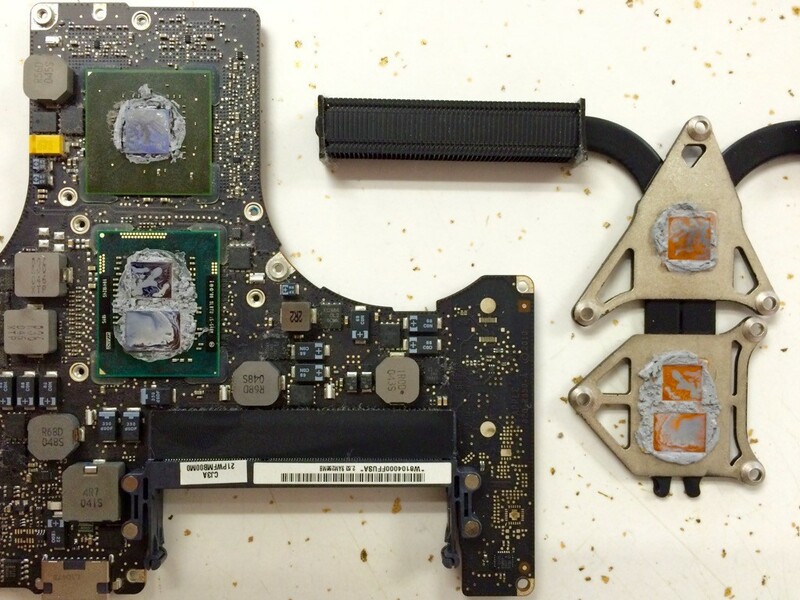 Look at all the excess thermal paste on both the chipsets and the copper plates in this example of a MacBook Pro logic board. What can be done about a failing graphics card? One option is to replace the GPU card. A replacement card is expensive and often times not worth purchasing in relation to the cost of the iMac itself. Also the replacement card will eventually display the same behavior because of the inherent overheating problem from the iMac’s design. There is another option though to give some extra life to the these failing graphics card. I use a method known as reflow. 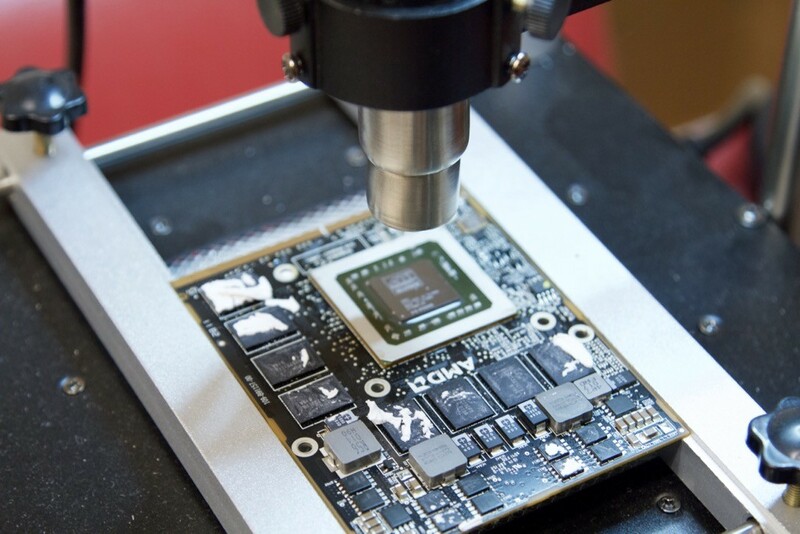 Reflow involves using a specialized heat gun heated up to 290º C to remelt the graphics card’s soldered connections. When solder is heated to this temperature, the tiny cracks disappear as solder melts and solidifies again. I also remove excess thermal paste and reapply a proper thin coat. When the iMac is apart, I always clean the inside and all components to restore its optimal airflow. The success rate of reflow work varies. 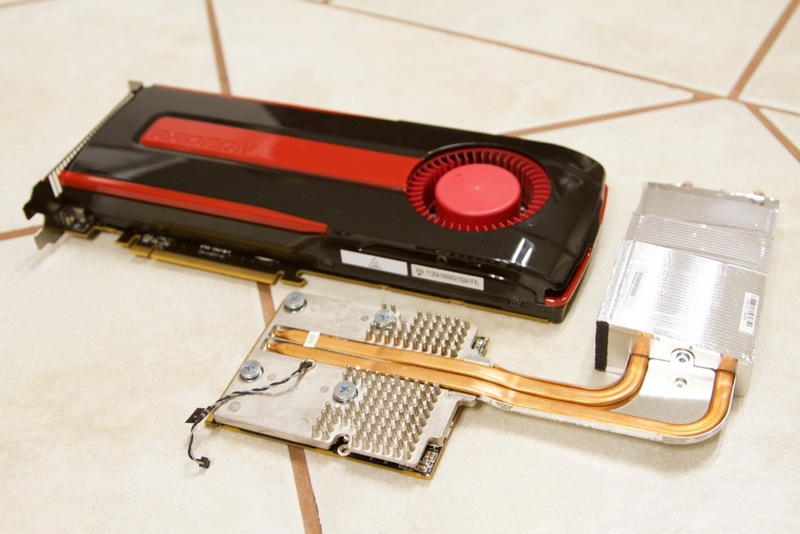 Some graphics cards are beyond repair, and the reflow is unsuccessful. If the reflow work is successful, the repair may last for a short or long period of time depending on usage and care. Eventually the issue will reoccur because of the way heat can build up within the iMac without being effectively forced out. I recommend reflow work for customers who are in search of a short-term solution for the overheating graphics card problem. I also recommend keeping the iMac in a well-ventilated area and dusting regularly so that air can flow as freely as possible. The iMac is a beautiful machine that appeals to many because of its compact and sleek design. These same features unfortunately make for an ideal overheating environment.